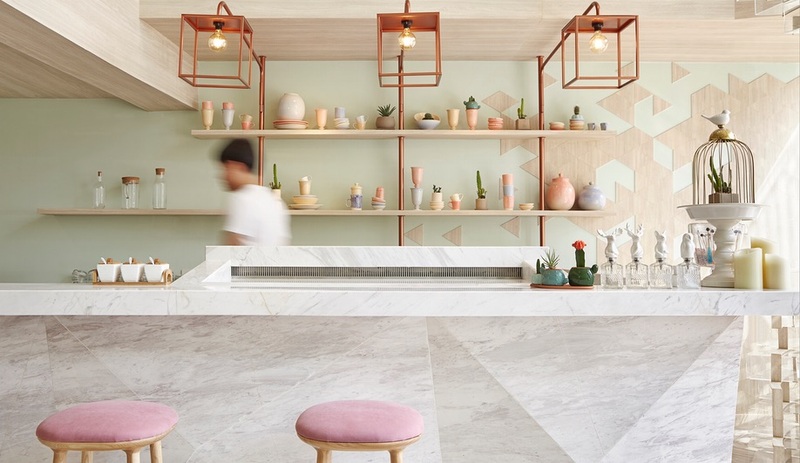 Commissioned to design a new dessert bar in Bangkok, local firm Party / Space / Design has whipped up an interior based on the same element that forms the foundation of the menu: sugar. 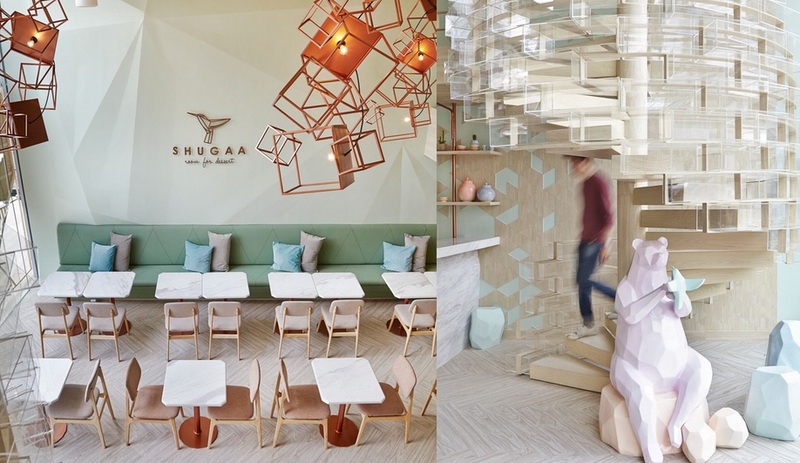 Located in Ekkamai, an area of Bangkok known for its trendy restaurants, Shugaa dessert bar features a menu of elaborately constructed desserts and a super sweet space to match. 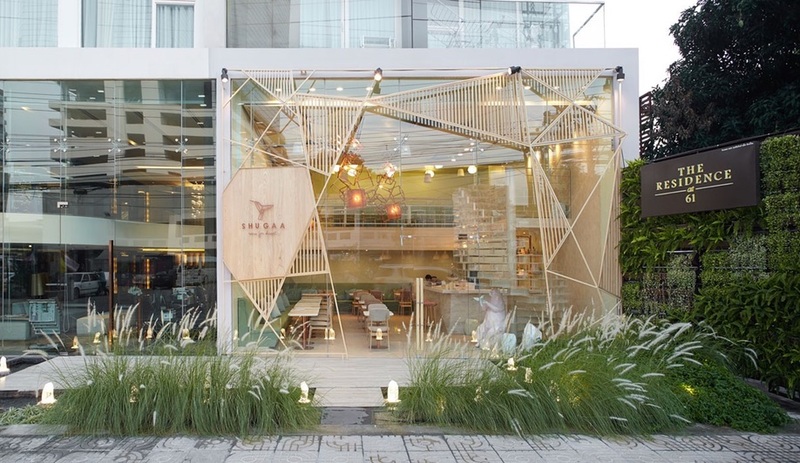 The building itself resembles a massive sugar crystal – a transparent, cubic volume, given polygonic planes by floating a geometric wooden screen over the flat glass facade. 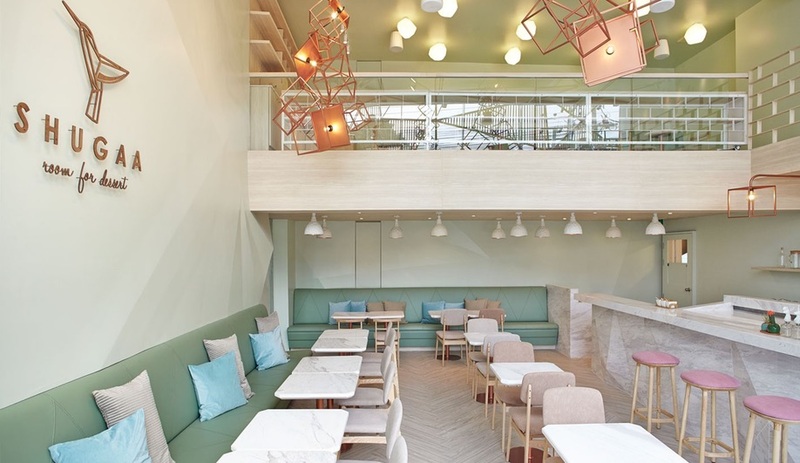 Inside, Part / Space / Design devised a colour scheme that appropriately resembles a softened after-dinner mint palette, with light and champagne pinks, baby blue, and pale minty green. 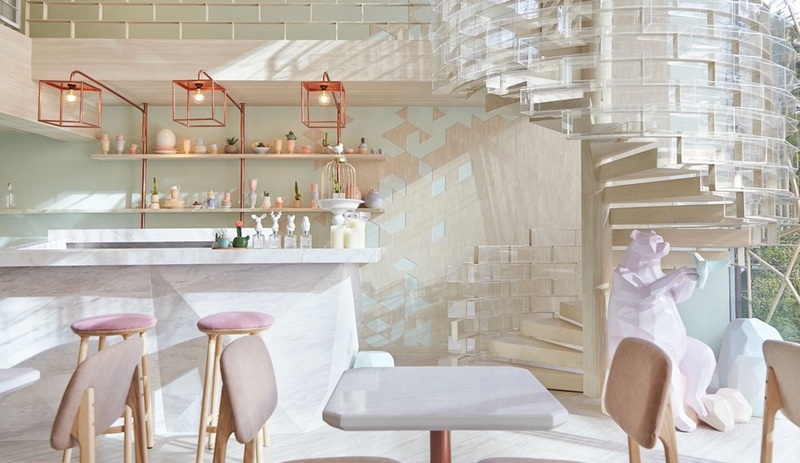 The two storey-space is bright, airy, and surprisingly luxurious, with a long banquette running along the length of one side of the room and lightly veined marble bar on the other. 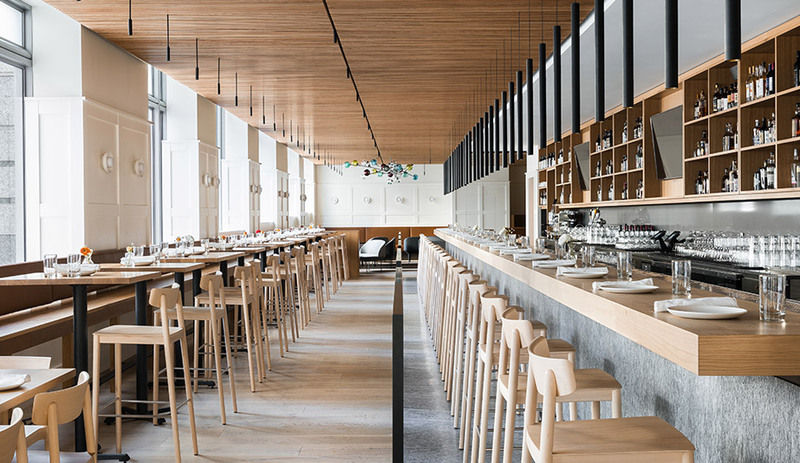 Rather than crowding in as many tables as possible, a single line of marble-topped tables for two runs along the centre of the floor plan, allowing room for an intimate dining experience. 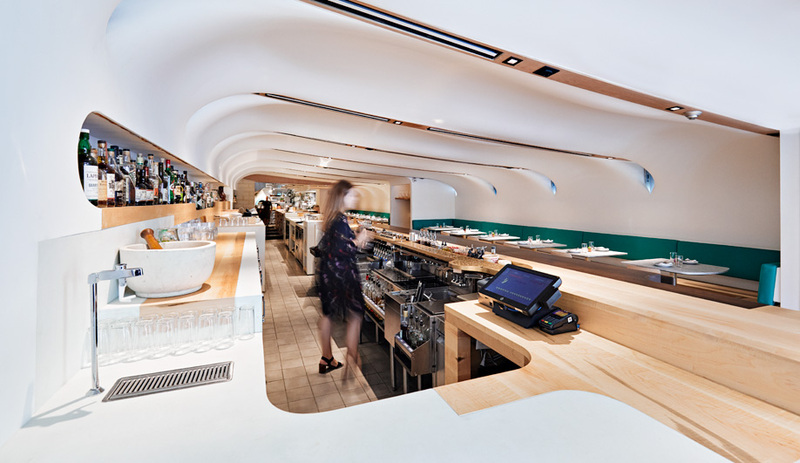 If you can tear your eyes away from the desserts being carefully assembled by the chef at the open prep bar, you’ll want to look up at one of two of the room’s standout features. 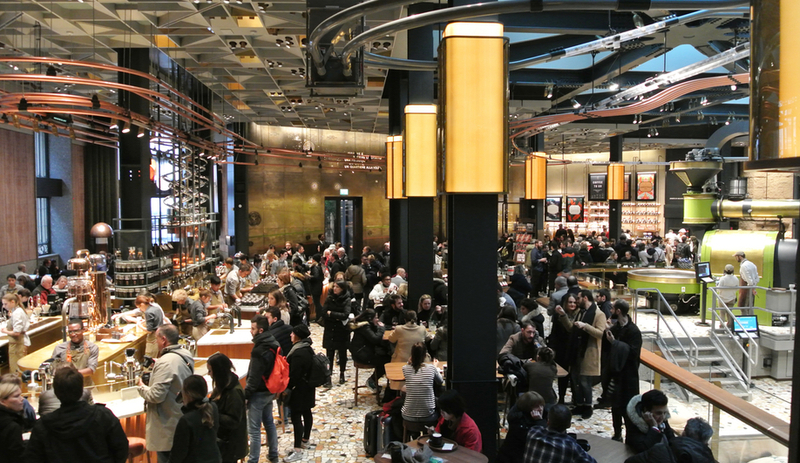 The ceiling itself is accented with the same sculptural wood patterns used outside, and then dotted with a series of round white lights that are reminiscent of the kind of miniature marshmallows you might find floating in a cup of hot chocolate. 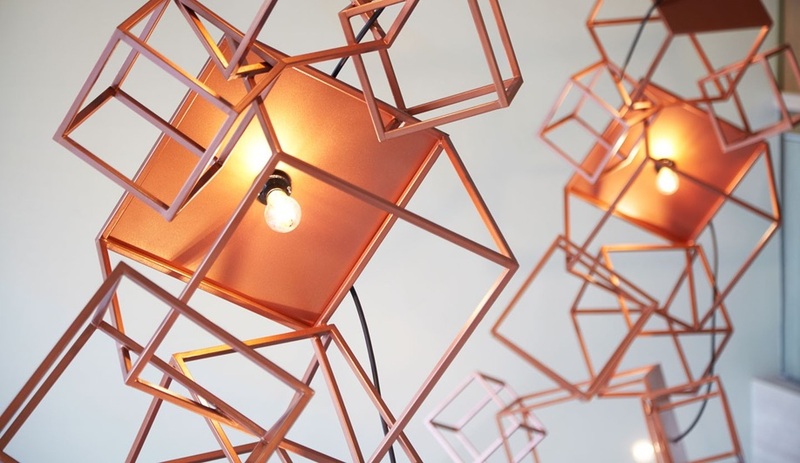 These are sprinkled around a lighting installation formed from sugar cube-shaped rose gold frames. The second highlight – a spiral staircase, wrapped in a curving wall of acrylic boxes – is another sugar molecule–inspired intervention. The blocks transition into a wood railing that reflects the blonde oak used on the floors, ceilings, and a feature wall beneath. 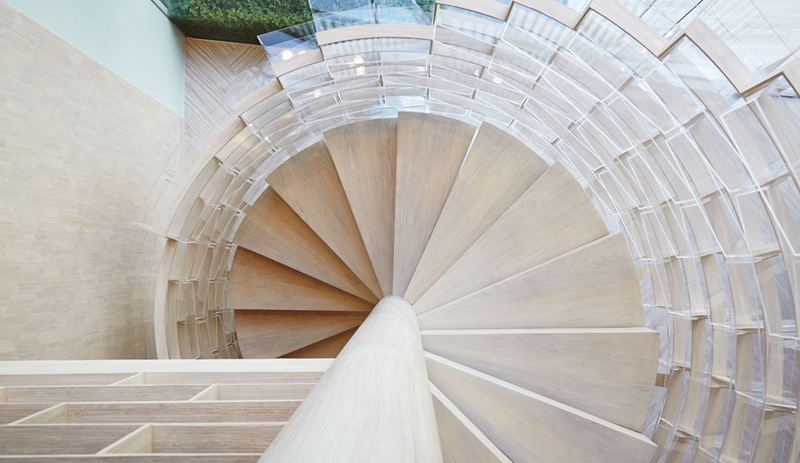 Ascending this winding path leads to a private dining area on the mezzanine level. 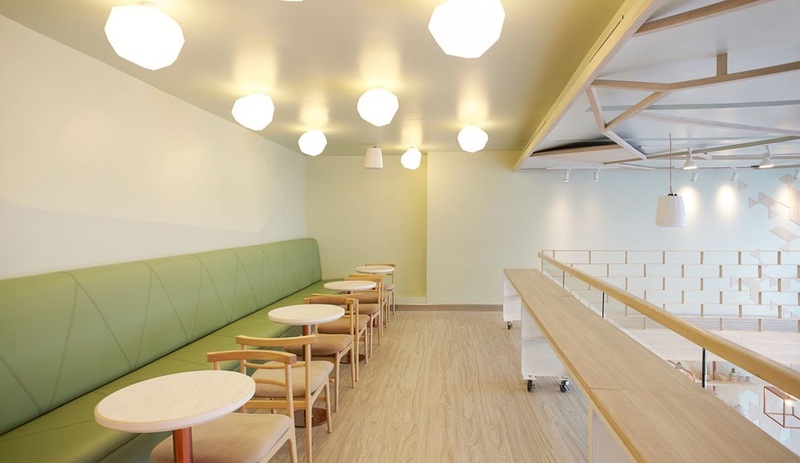 The space is easily reconfigured to host workshops that offer customers the opportunity to learn how to manipulate fondant into their own ornamented sweets. 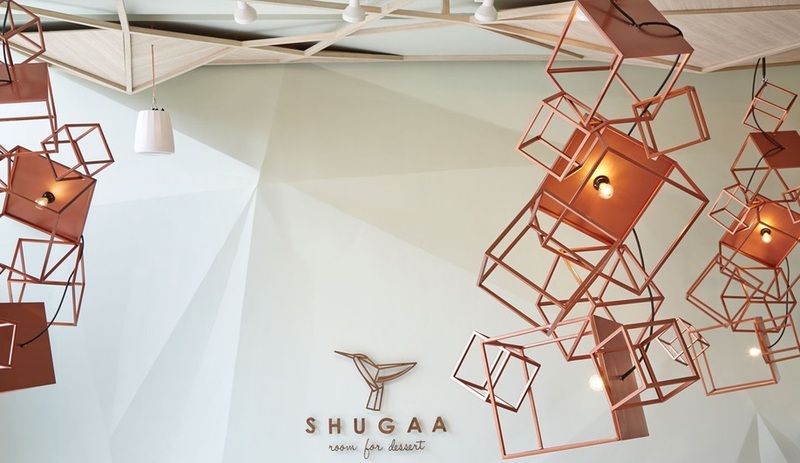 Serene and decidedly pretty, Shugaa is unexpectedly elegant, but not without its playful touches. At the base of the stairs, a whimsical pink bear clutches a blue dove, both carved from pastel acrylic. One has to wonder if he’s looking at the bird thinking that, much like the surrounding space, it looks good enough to eat.